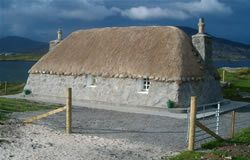 This original Hebridean thatched cottage has been recently re-stored to a modern self-catering accommodation. The cottage an ideal holiday get away from the demands of everyday life is located in the beautiful crofting district of South Lochboisdale at the southern end of the Western Isles. With its magnificent views of Lochboisdale, out to the Minch and across to Skye, the cottage is perfect for Hill Walking, Fishing and Birdwatching. On the west side of the island there are the lovely unspoilt beaches washed by the rolling Atlantic, home to a rich variety of wildlife. â€œSeann Taighâ€ comprises of two bedrooms, open plan kitchen/living area and toilet/shower room. The master bedroom has a double bed, built in wardrobe, bed-side cabinet & chest of drawers. The second bedroom is situated in the loft of the house and is accessible from the living area by ramsay ladder and also has a single bed, bed-side cabinet & Chest of Drawers. The lounge has two double seater sofas, one converts to a sofa-bed, a folding dining table and chairs, nest of tables.